September 21, 2012. We have heard from Homer Lange that he has bought #59 and is arranging for her to be shipped next week to her new home with the Dangerfield Island Sailing Club (“DISC”) in Washington, DC. Click here to go to her new page. Rebuilt inboard 8hp Palmer engine, 2 self-tailing Harken winches, Harken main traveler, lines lead to cockpit, stainless steel propeller shaft with dripless stuffing box, digital anemometer and speedometer, compass, instrument panel, marine VHF radio, icebox, interior cushions for four berths, two custom cockpit cushions, two electric bilge pumps, tandem axle trailer with four new tires, some extra equipment included. Needs some deck restoration. Please call 847-256-4133 for more information. After much hand-wringing, we are putting Harbor Rat up for sale. 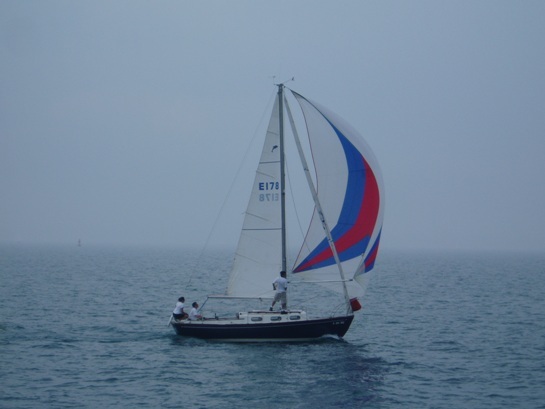 We would love nothing better than to try and keep her here with the Wilmette Fleet. The best case scenario would be for a local sailor to buy her, invest in her restoration, store her, and wait until there is an open mooring. I am attaching a listing sheet for the website...it will have just the basic information until we figure out what we are keeping and what is staying with her. June 10, 2010. Kristin sent in the following update (edited) on Duet/Harbor Rat, as part of her report on the Wilmette Fleet. Click here to see that report. Also, some really good photos, see below. Duet is now Harbor Rat...we had a wonderful renaming ceremony involving a call to the gods of wind and sea and lots of red wine! Several fleet members came, which was sweet. We were told she is 1963 O'Day. Her first owner here in Wilmette was Leon Wilke, then George Reichert, then Mike Clark, then Larry and Ron Falbe (Celerity) and finally Dave and I have owned her since 2004. Maybe you will get some clues from her nameplate (photo attached). The Wilmette Fleet is 14 strong and we race every weekend in the summer and have anywhere from 3-8 boats on the line. Harbor Rat (Duet) is the reigning fleet champion for the last two seasons and going for a third :) This year we might have a couple of races with 9 boats! John Hellmuth (Echo) is now the Dolphin Fleet Captain and I've been given a promotion to "Dolphin/Cruising Fleet Captain"....such that it is!! Your website has been a god-send to all of us. We really appreciate all your hard work.